Born in 1964 in Kolkata, Roy studied printmaking at the Visva Bharti University of Santiniketan. 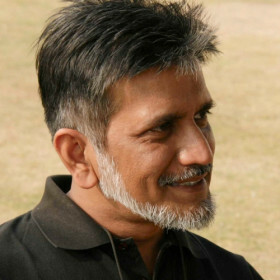 He did his Masters in Fine Arts (Painting) at the M. S. University, Vadodara. In 1990-92 he received the Inlaks fellowship to study Painting at the Royal College of Art, London. He also received the Fulbright Scholarship in 2004-05 for six months to study in the USA. The artist has a trademark cityscape that adorns the art wall of the airport in Mumbai. He lives and works in Vadodara. Untitled 1 | 29" X 21"
Untitled 2 | 29" X 21"